Betfred is considered to be an “old hand” in the sports betting industry. The British bookmaker has been offering sports betting since 1967. The long-standing experience in the betting scene is paired by a fair and varied offer. Furthermore, it sponsors a number of sports and events. The bookmaker is based in Warrington, England and has two gambling licences: One from the UK and the other from Gibraltar. 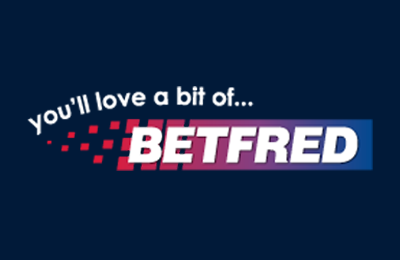 This Betfred review will take a look at various features of the Betfred offer, from the payment methods to the sports portfolio and even the Betfred bonus, to see whether this sportsbook lives up to its reputation. Place your first on the outcome of any Lotto draw and get a matched bet of up to 25 GBP! If your player scores the first and second goal of the match Betfred will double the first goalscorer price. If your players scores a hat-trick, Betfred will treble it! Easy, fast and secure payment powered by PayPal©. Make profits live, while watching the game! Receive exceptional telephone support from this bookmaker. Chat with the support staff immediately from a web browser or app. Get the app to use the services on the go, anytime, anywhere. Betfred is a UK-based bookmaker that was founded by two brothers: Fred and Peter Done. The company started as a single betting shop called Done Bookmakers in Ordsall, England back in 1967. Thirty years later, they bought a chain of bookmakers and ended up owning 100 shops in total. The company was renamed “Betfred” in 2004, the same year that it went online. Regarding the legitimacy of the sportsbook, according to our Betfred review not only is it regulated by the UK Gambling Commission but it also licensed by the Gibraltar Government. In addition, it is a member of the Independent Betting Adjudication Service (IBAS), which provides informed and impartial adjudications on gambling disputes. According to our Betfred review, the current Betfred welcome bonus is a free bet offer. This promo is offered to new customers residing in the UK or Northern Ireland, who are 18 years old and above. Once a first bet is placed in the amount of £10, you will receive £30 worth of free bets. There is no Betfred promo code for this promotion, but some conditions must be fulfilled in order to obtain the full bonus amount. To take advantage of this offer, you must register at Betfred and first make a deposit of at least 10 GBP. Afterwards, your first bet (only the first one) counts towards the 30 GBP free bet offer. This first bet must be placed at a cumulative price of evens (2.0) or greater in order to qualify. Our Betfred review provides you with step-by-step instructions on how to obtain your Betfred free bet offer. Please follow the steps carefully, since any error might disqualify you from getting the free bet. Step 1 – Registration: First of all, you must register at Betfred. To do so, simply click on the green “Sign up now” button at the top of the homepage and fill in the registration form with your personal details, account details and reply to a security question. Then click on “Register” to finalise this process. Step 2 – Making a deposit: Got to “My Account” and click on the “Deposit” tab. Fill in the required fields such as amount and currency. Remember to deposit a minimum of 10 GBP to be eligible for the free bet. Confirm your deposit with your password. Step 3 – Fulfil the bonus conditions: Your first bet must be placed at a cumulative price of 2.0 or greater. Any bet type on the sportsbook market is valid. However, this must be ONE total stake of at least £10. Please note that two £5 bets will NOT qualify. Step 4 – Use the free bet: Once your qualifying bet is settled, the free bet amount of £30 will be in your account within 48 hours. The Betfred Free Bet amount must be wagered once on eligible sports markets before you can withdraw any winnings. The free bet is only valid for 7 days. The Betfred free bet bonus is not the only offer at this bookmaker. During our Betfred review, we noticed that existing customers also have the chance of taking advantage of various bonuses. For instance, the “All Correct Bonuses” offer is for horse and greyhound races. As a customer, you can get a bonus of 10, 20 or even 25% on your total winnings if all of your selections are winners. Another offer is the “Betfred Cash Bonus on Trebles and Four Folds”. In this case, you can obtain a 5% bonus on winning football trebles with all selections over 1/2 and get a 10% bonus on winning football four-folds with all selections over 1/2. This particular offer is paid out in cash. While roaming the Betfred sportsbook for this Betfred review, it stood out that this sports betting provider has focused its selection mostly on the British and Irish markets. A large number of football bets from many different leagues can be placed, as well as some lucrative sports bets for insiders are included. Various traditional sports, such as cricket and the Gaelic Games are of course also on offer. The betting offer at Betfred might not be the most extensive one, but it is very interesting. What is more, at Betfred you can also wager on virtual sports as well as on non-sports events. Although Betfred has a live-stream option, as a part of the in-play product, once again the focus here is mainly on the UK and Ireland. During our Betfred review, the events that could be watched live were football, darts, snooker, tennis, basketball, cricket, baseball, American football, as well as horse racing and greyhounds. The Betfred odds are among the best in the online gaming business as we realised during our Betfred review. This bookmaker has a profit margin of about 5%, and this even drops to 3.5% when it comes to football. The lower the profit margin of the bookmaker, the better the payout for you. In addition, Betfred offers a best odds guarantee for horse and greyhound races. This means that you will be paid out at a higher price if the final selection price is bigger than your early price selection. This Betfred review found that the bookmaker is quite good. Players here are offered some of the best odds on the market. Even though the portfolio focuses mainly on typical British sports, there is still a large variety of leagues and tournaments to be bet on. Live bets round up the selection offered by Betfred. Furthermore, you can always feel safe when betting at this sportsbook and this is extremely important for most punters. The customer service staff is competent and available around the clock. The welcome bonus consisting of a free bet is definitely attractive for new customers and can easily be redeemed. As such, this sportsbook can be recommended, especially for fans of British sports. There are various methods of payment offered for depositing and withdrawing money at Betfred. Although our Betfred review determined that the bookmaker does not charge anything for deposits made by debit or credit card, you must know that some credit cards have fees for using their service for gaming purposes. The minimum deposit amount is £5. In the case of e-wallets Neteller and Moneybookers, one deposit a day is free at Betfred. PayPal, on the other hand, is free of charge. Please note that the minimum deposit here will vary from £5 to £10. All other payment methods may be subject to a 2.9% fee by Betfred. Step 1 – Go to the banking section of your account: The simplest way to deposit is to go to “My Account” after logging in and click on the “Deposit” option. Step 2 – Select the desired payment method: Choose your preferred payment method and fill in the amount as well as the type of currency for your deposit. If the option you selected comes with any fees, Betfred will display these. Step 3 – Transact: Click on “Deposit” to complete your transaction. In most cases, the money will be in your account shortly after. All withdrawals are subject to a Betfred security check. According to our Betfred review, this means that they can take up to 48 hours to be processed. In order to prevent money laundering, withdrawals are paid back to the original deposing method as a rule. If this is not possible, as in the case of some prepaid cards, then the bookmaker reserves the right to request additional documents to verify the customer’s identity. Our Betfred review revealed that this sportsbook offers all the regular channels to get in touch with the customer service area. If the extensive FAQs section is not enough for you, do not hesitate to contact the support. The fastest option is the live chat which is available 24/7. If you prefer to write an e-mail, then Betfred actually has four options for you depending on your issue. The main address is support@betfred.com. The following ones are for more specific enquiries: technical@betfred.com, accounts@betfred.com and freebetqueries@betfred.com. Of course, there is also a telephone hotline. Customer support is only offered in English. It comes as no surprise that Betfred would also be present in the social media. As experienced by this Betfred review, there is a wide range of videos available on YouTube, from the Betfred story to press conferences of sports events. On Facebook and Twitter, sports news are published as well as special promotions, like the chance of winning tickets to a football match. Reliable or scam: How safe is Betfred? During our Betfred review, there were no unpleasant experiences nor any hints of a scam at Betfred. Punters can feel safe at this sportsbook since data is encrypted, preventing access by third parties. The British gambling provider has been in business for 50 years now. Licences from the UK and Gibraltar imply that Betfred must comply with strict regulations and that the bookmaker is regularly inspected. How can I register at Betfred? This is quite simple. Just click on the “Sign up now” button at the top right of the homepage and fill out the registration form with the required details, including personal information, username, password and deposit limits. The whole process can be done in just a few minutes. Do I need a Betfred bonus code? No, you don’t. As soon as you make a qualifying bet of 10 GBP on a single bet of evens or greater, Betfred will give you a free bet worth 30 GBP. This will be available in your account within 48 hours after settling your qualifying bet. Is there a Betfred App? Yes, there is. You can have access to the Betfred sportsbook on your mobile or tablet when you are on the road. Just download the app from the App Store or Google Play. Do I need to bet to watch a live stream? Yes and no. Some sports can be watched without having to place a bet, such as basketball, football, handball tennis, ice hockey, badminton, beach soccer, volleyball and ITF tennis. For horseracing and greyhounds though, you must place a bet with a stake of £1 per race. Can I use PayPal as a payment method? Yes, you can. This is probably the safest way to deposit money into your account since it is done using the PayPal platform. In addition, Betfred does not charge you any fee for making deposits via PayPal. The fact that Betfred has this method of payment is a clear indication that the bookmaker is legitimate.